The Gretsch Chet Atkins amplifier has some unique features that warrant investigation: an active 12AX7 mixer driven by independent channels, each in turn having separate bass and treble channels that drive a passive mixer. This article focuses on these aspects of the design. It also derives a formula for the gain of the active mixer. Unlike that vast majority of guitar amplifiers, the Gretsch Chet Atkins uses the two triodes of a 12AX7 to drive bass and treble controls independently. Each triode forms a traditional common-cathode voltage amplifier. The treble channel preamp is as shown here. The coupling capacitor driving the bass control is large enough to act as a short circuit for all audio frequencies. For the treble driver, it is only 0.001μF, which creates significant bass attenuation. The cathode resistor for the treble driver is 1.5kΩ and is bypassed by a 35μF capacitor. This effectively shorts the cathode to ground for all audio frequencies and creates 38dB gain. The cathode resistor in the bass driver is larger, 2.2kΩ, and unbypassed. According to the Preamp Gain and Output Impedance calculator, this reduces the unloaded gain to 34dB. The treble driver's output impedance is about 51kΩ. The calculator shows that the bass driver has an output impedance of 139kΩ. In many circumstances a high output impedance is a disadvantage, because the stage is more likely to be bogged down by the load it is forced to drive. In this case, however, the output impedance is a desirable artifact. The design, in fact, places a 150kΩ resistor in series with the output impedance driving the bass channel, as shown below. The output impedance is shown here in front of the bass control, which consists of a low-pass pi network followed by a volume control. 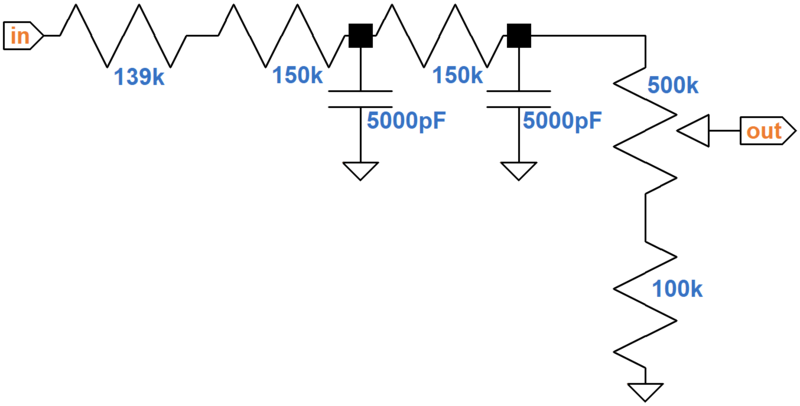 The potentiometer and resistor below it form a 600kΩ volume control with a lower limit of 100kΩ. The Gretsch uses 0.005μF capacitors. 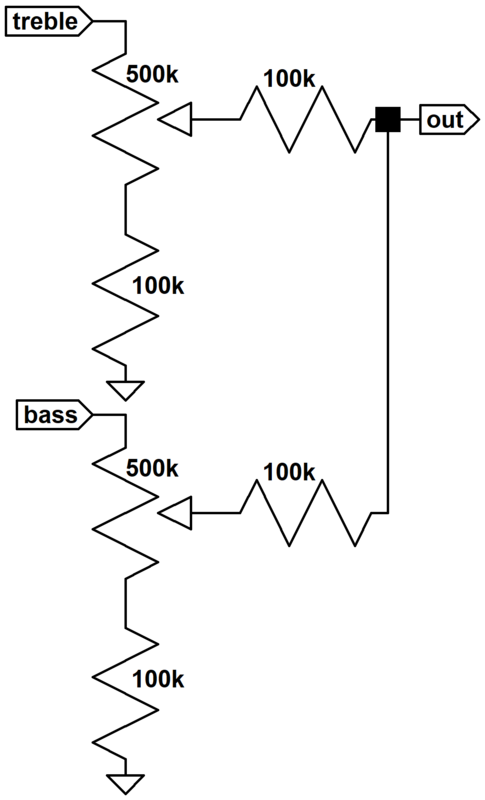 Here are the bass responses for the more common values of 0.0022uF, 0.0033uF, 0.0047uF, 0.0068uF, and 0.01uF. The graph assumes that the volume control is set to maximum and that its impedance is large enough compared to the other resistor values that it can be ignored. Increasing the capacitor value steepens the slope of the curve near 82 Hertz, which is the lowest note of a guitar with standard tuning. At higher frequencies all the curves eventually transition to 12dB attenuation per octave. This is twice the cut of a simple RC filter - this is quite an aggressive control! 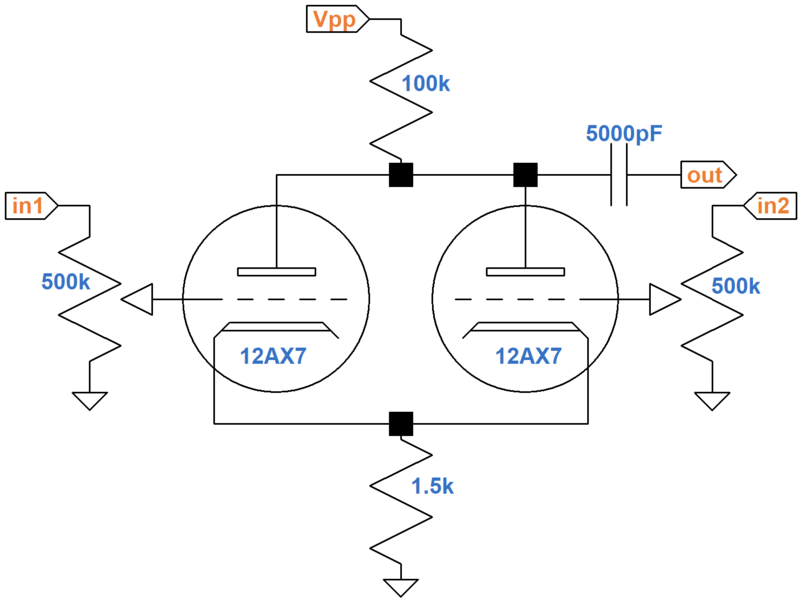 Here is the driving circuit output impedance and the treble control, which consists of a high-pass T network followed by a volume control. The Gretsch Chet Atkins uses capacitor values of 0.001uF and 500pF. Here is the treble response for nearby values. A passive mixing circuit formed by the 100k resistors is used to mix the channels together. In contrast to the isolation of the bass and treble driving stages, the passive mixer introduces some interactivity to the controls. Turning down the bass control affects treble response via the mixing resistors and vice versa. Even with isolated drivers, the Chet Atkins controls have substantial interactivity, a characteristic common to many classic amplifiers. The 100kΩ limiting resistors mitigate the effect somewhat by limiting the load each stage presents to the other. The Chet Atkins also contains an active mixer that is rarely seen in a guitar amp. The preamp has two channels, each with its own bass and treble controls and a passive mixer. 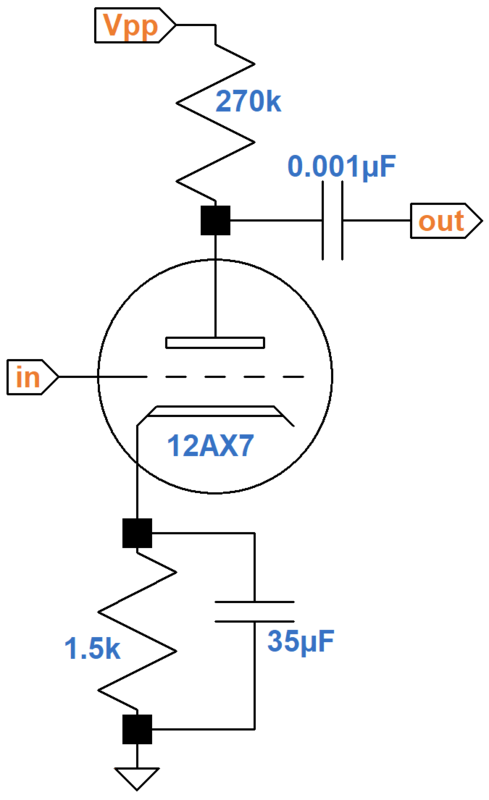 The channels are combined in a 12AX7-based mixing circuit. The output is taken from where the plates connect to the 100kΩ plate load resistor. Since the resistors carry the plate current of two triodes, the DC operating point is the same as for a single triode with a 200kΩ plate load resistor and 3kΩ cathode resistor. AC voltage gain for each channel is less than for a single triode amplifier because of additional negative feedback. Imagine a rising voltage on the left input (channel 1) and no signal on the right. The increasing grid-to-cathode voltage causes an increase in plate current through the left triode, which creates more current through the cathode resistor. This raises the voltage across the resistor, causing the cathode voltage to rise and counteract the rising grid-to-cathode voltage induced by the input signal. This represents classic negative feedback. Moreover, there is common cathode coupling: a rise in cathode voltage for the left triode creates a similar rise in cathode voltage for the right triode. The net result is that the rising input signal causes the total current through the 100kΩ plate load resistor to increase while at the same time negative feedback in both triodes causes the total current to decrease. The Radiotron Designer's Handbook1 calls this a "common plate load mixer." 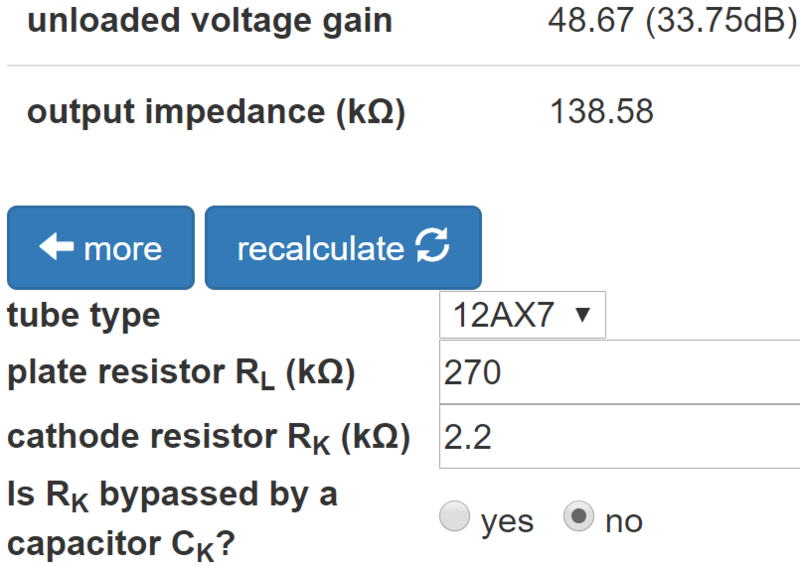 We posted a calculator that computes voltage gain and output impedance based on the tube and the values for the plate load and cathode resistors. 1F. Langford-Smith, Ed., Radiotron Designer's Handbook, 4nd Ed., (Harrison: RCA, 1953), p. 800. 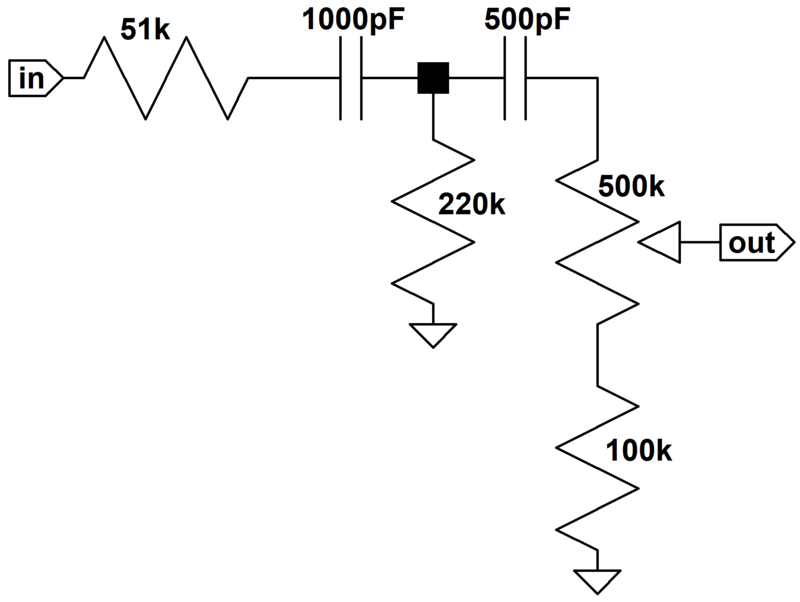 2Richard Kuehnel, Circuit Analysis of a Legendary Tube Amplifier: The Fender Bassman 5F6-A, 3rd ed., (Seattle: Amp Books, 2009). 3Richard Kuehnel, Vacuum-Tube Circuit Design: Guitar Amplifier Preamps, 2nd Ed., (Seattle: Pentode Press, 2009).